It is a question that the Rev. Robert W. Bullock asks himself all the time. When anti-Semitic vandals hit Sharon a few years ago, the suburb with a large Jewish population where he is pastor of Our Lady of Sorrows Church, Bullock, a Holocaust historian, stood shoulder to shoulder with the local rabbi to denounce bigotry. When the sexual abuse scandal exploded in January, the 72-year-old Bullock formed a group, the Boston Priests Forum, to address the crisis of clergy morale that accompanied it. When priests complained that the scandal had led archdiocesan officials to trample on their rights to due process, Bullock spoke up for accused priests. But throughout the scandal, Bullock spoke passionately about how those who had been sexually abused by priests had been failed by their church, and that the church's first obligation was to reach out to the victims with compassion. After all, he says, it is what Jesus would do. Many theologians say it was the letter circulated by Bullock's group, calling for Law's resignation and signed by 58 of the archdiocese's 550 active priests, that last week made it impossible to turn down Law's resignation, as Vatican officials had in April. On Friday, as word of the pope accepting Law's resignation spread, there was no sense of victory coming from Bullock and the other rebel priests. There was no sense of satisfaction in ending the Boston tenure of their cardinal. ''This is a tragedy, what has happened to this man,'' Bullock said, glumly. Now, Bullock said, it is time for Catholics to return to the pews, to hear the good news of the Gospel, even as they reflect on the forces that so deeply hurt the church. He is the pope of Boston's Catholic power brokers, the child of Irish immigrants, the founder of the city's most successful advertising agency, a philanthropist, a man whose influence wends its way through the curious intersection of religion, ethnicity, and commerce that is unique to Boston. He is Jack Connors Jr., and for 17 of Bernard Law's 18 years as archbishop of Boston he was arguably Law's most trusted confidant in the business community. When the cardinal found himself under fire last winter for his handling of sexually abusive priests, Connors instinctively rallied to the cardinal's side. He helped organize a meeting in February of doctors, lawyers, and businesspeople, a virtual Who's Who of Boston's Catholic elite, to advise Law how to respond to the crisis. Connors's advice was blunt: Tell the whole truth, and nothing but. But Connors could sense Law wasn't listening. And he came to a more disturbing conclusion: The cardinal wasn't being honest with him. In the spring, when Connors publicly walked away from Law, saying the cardinal wasn't listening to him or anybody else, the city's other power brokers sat up and noticed. If Jack had turned his back on Law, the word went, the cardinal was history. Connors, who had helped raise millions of dollars for his church, began withholding donations. Others followed suit. On Friday, after he learned that Law had resigned, Connors chuckled ruefully when asked if one of his ambitions as a young man was to someday help bring down an archbishop. ''I'm almost 60 years old. It took a long time to get my faith to where it is. My faith is not shaken. My faith in the leadership of my church is shaken. You know, there's a lot of good priests out there, working with the poor, the sick. I know a lot of them ... When it came to this situation they couldn't say anything. So maybe it was up to me and other people to say things. Still, he was asked, it must be painful, knowing that the cardinal he helped steer through the cliquey corridors of power in Boston he also helped steer out the door. Boston is a notoriously parochial place, and when the sexual abuse scandal burst onto the front page in January, there was a tendency by some to consider it a local phenomenon. David Clohessy did much to change that perception, urging people to see the scandal in a national and international light. As the national director of the Survivors Network of those Abused by Priests, or SNAP, Clohessy became a tireless advocate, a voice for victims nationwide, and even abroad. ''It's not just Boston, it's everywhere,'' said Clohessy, 46. It is a lesson he learned at great personal cost. When he was a boy in Missouri, Clohessy says, a priest abused him for four years, beginning when he was 12. His brother, Kevin, became a priest, but left the priesthood after being accused of molesting another man. Clohessy says his brother was abused by a priest as a boy, a cycle of abuse he says is common. The two brothers remain estranged, their relationship another casualty of the scandal. Like many victims of clergy abuse, there was no justice for David Clohessy. By the time he went to court, the crimes he says were committed against him fell outside the statute of limitations. Today, Clohessy seeks vindication by helping others, and by forcing authorities to take victims' perspectives into account. Along with other SNAP leaders, Clohessy's vocation is to stick up for those who have long stayed in the shadows, hounded by guilt, shame, and stigma. SNAP now claims some 4,000 members nationwide. 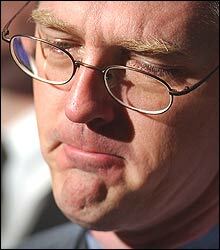 He sees Law's resignation as significant, but something of a sideshow. Olan Horne was a 12-year-old schoolboy in the 1970s when his local priest, the Rev. Joseph E. Birmingham, first cornered him at St. Michael's Church in Lowell. Birmingham would go on to molest him, just as he had molested dozens of other boys. But Horne fought back, and on one occasion Birmingham beat him severely. Birmingham, one of the most notorious pedophiles to emerge from the sexual abuse scandal in the Boston Archdiocese, is dead, but Horne is very much alive, and still fighting. Horne embodies many victims of predatory priests who have found their voice, and their courage, to come forward in the last year. He helped organize a group of Birmingham's victims, called the Survivors of Joseph Birmingham. He has a good enough sense of humor to allow that the acronym by which he and his friends call the group, SJB, makes them sound like a religious order. Horne lost his faith because of his experience. ''I'm a proclaimed agnostic,'' he says. Still, he retains his own sense of faith and he has not lost a faithful desire to hold not just Birmingham, but the dead priest's supervisors, accountable for the devastation visited on him and so many others. Horne and other Birmingham victims, including Gary Bergeron and Thomas Blanchette, hounded Cardinal Law for months, demanding that he meet with them so that the cardinal could see, firsthand, the casualties of his lax supervision of sexually abusive priests. Two months ago, Law walked into the basement of a Dracut church and did just that. More than 70 of Birmingham's victims told Law what Birmingham had taken from them, and how they and others continue to pay the price for decisions made by Law and other bishops. Two weeks ago, Horne met with Law at the cardinal's residence and told him all the words in the world would not help with the healing. 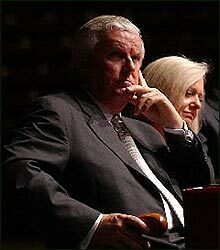 ''Do something bold,'' Horne told the cardinal. A few days later, the cardinal was in Rome to begin the slow dance that was his resignation. 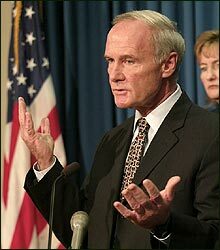 Those who know Roderick MacLeish Jr. call him Eric. Those who go up against the brash lawyer often call him something else, and it's seldom flattering. But for those who find themselves up against powerful institutions, MacLeish is a tenacious litigator who has often proved to be an effective advocate, someone who courts publicity and often uses it to help his clients make their cases as effectively in the court of public opinion as in a court of law. MacLeish and his partners represent hundreds of people who have outstanding claims against abusive priests and the archdiocese, but it was MacLeish's handling of the accusations his clients brought against one priest, Rev. Paul R. Shanley, that came to epitomize MacLeish's extraordinary ability to build public sympathy for his clients. When the sordid details of Shanley's past emerged in the spring, MacLeish put together a spellbinding multimedia presentation, highlighting the warnings that Law got in the 1980s that Shanley had spoken publicly in favor of sexual relationships between boys and men. It was a tour de force that local televisions stations carried live, and it convinced many people who had supported Law during the first few months of the scandal that he had to go. MacLeish's role in forcing the archdiocese to come clean may be his biggest case yet, but it is not the first time he has aggressively challenged a powerful institution. In the 1980s, he forced officials to halt draconian measures such as public strip searches at Bridgewater State Hospital, the state's largest psychiatric facility. Others drove the disclosures that fueled the church scandal, most notably Mitchell Garabedian, whose legal tenacity, over eight years, built an array of civil suits against an impish priest named John Geoghan, encompassing more than 100 victims, that last Janaury spilled out into the cold light of day. 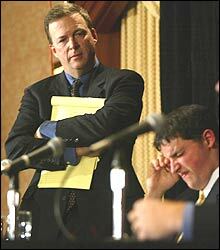 But MacLeish, who has a natural empathy for outsiders, was the most flamboyant of the church's legal tormentors. The grandson of a poet and the son of a journalist, he helped expose the Boston Archdiocese's appalling record in handling abusive priests, work that was, for him, nothing new. In 1991, he represented Frank Fitzpatrick, the man who first publicly accused James Porter, a Massachusetts priest who abused hundreds of children. Like no other attorney, MacLeish relishes getting Law and other church supervisors under oath. And while the cardinal may no longer be archbishop, that will not save him from future questioning by the lawyer that the church's lawyers love to hate. When he was a boy growing up in Springfield, Tom Reilly was expected to be home every night at 7 sharp. It was then that he knelt down with his family and said the rosary. Today, as the highest-ranking law enforcement official in Massachusetts, Reilly remains a devout Catholic, but he has convened a grand jury that is charged with deciding whether Law and other church supervisors should face criminal charges for putting priests in a position where they were able to sexually abuse children. Most legal observers believe, and Reilly ruefully admits, that there is little chance that Law and his aides will be indicted, because Massachusetts law requires that such enablers must demonstrate that they had the intent that such crimes would occur. Reilly has been criticized by some who say he has not been aggressive enough in pursuing Law and others, and that the church is getting a slide where other institutions would not. But ever since the scandal broke last January, Reilly has been a thorn in Law's side, forcing the cardinal and his lawyers to go places they don't want to. After the story broke in January, Law promised that any future allegations of abuse by priests would be passed on to prosecutors. Reilly went public and said it wasn't good enough, that prosecutors needed to look at past cases to determine whether criminal charges should be filed. 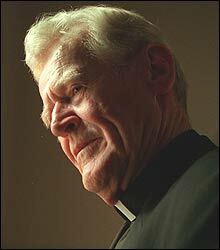 When the church dragged its feet, Reilly forced its hand, getting the files on nearly 100 priests. Last summer, Reilly convened a grand jury to resolve the question whether Law's actions, and those of his handpicked aides, rise to the level of criminal activity. In recent weeks, Reilly has been even more vocal and more critical, accusing the archdiocese of stonewalling him at every turn. Still, every week, protesters converged outside the Cathedral of the Holy Cross in Boston's South End to demand not only that Law be sacked as archbishop, but that he be indicted. Indeed, when the cardinal returns from Rome, as is expected sometime this week, he will find something from Reilly waiting for him: a subpoena to appear before the grand jury. 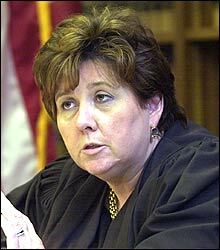 When Law's legal team saw they had drawn Superior Court Judge Constance M. Sweeney to preside over the Boston Globe's challenge to unseal court filings about John Geoghan, a priest who was accused of molesting scores of children, they could be forgiven for thinking they were lucky. After all, Sweeney was a practicing Catholic, the product of 16 years of parochial schools in her native Springfield. It was perhaps because of Sweeney's background that her ruling, unleashing the first tidal wave of disclosures that would eventually bring Law down as Boston's archbishop, seemed earth-shattering. But the reality is that Sweeney has spent as many years on the bench as she did being taught by nuns, and she has carved out a reputation among her peers as a fiercely independent jurist. As much as any lawyer who has sued the archdiocese, Judge Sweeney has been an irritant for the cardinal and his legal team. Over the years, previous judges had upheld the church's contention that its private settlements with victims of abusive priests should be hidden from public scrutiny. But Sweeney said the public had a right to see matters adjudicated in a public court. She ordered the release of the documents. Later, she ordered Law to be deposed. More than that, Sweeney infuriated Law's lawyers by insisting that the cardinal be deposed immediately because the Vatican might call him back to Rome to avoid questioning. And so, in what would be one but not the last humiliation of Law, the cardinal was made to stride past a phalanx of TV cameras and enter a courtroom, the first cardinal questioned under oath for actions taken as a prince of the church. It was another Sweeney order that sealed Law's fate. Three weeks ago, Sweeney declared that the archdiocese's own records suggested Law was lying when he testified that he and his aides did not return abusive priests to parish work when there was any chance they could abuse children. On Dec. 3, the first 2,200 pages of some 11,000 pages of documents that Sweeney ordered unsealed were made public, showing that Law had coddled abusive priests, allowing some of them to stay in ministry as recently as 1999. The disclosures led 58 archdiocese priests to say enough was enough and sign a letter calling on Law to step down. This story ran on page A51 of the Boston Globe on 12/15/2002.